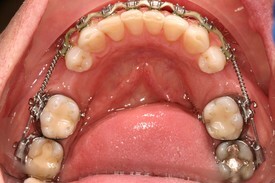 Adult Orthodontics was used to create the spacing to restore the two sites with an ideal tooth size. Implants were placed, and later restored with implant-supported crowns. Front tooth was broken under gumline (tooth on right with red gum margin). 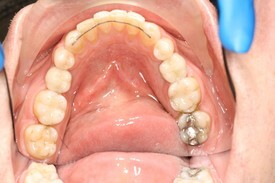 Case was treated by first placing a temporary crown, which allowed tissue healing. Case was completed with an implant-supported crown and matching veneer to maximize esthetic result. This case illustrates the potential of modern implant dentistry to render lifelike results. After: Smile and function restored with a Single Implant and an All Porcelain Crown (Cap) to replace missing tooth. Adjacent tooth was veneered to optimize esthetic outcome.